This dual mantel comes with an additional corner piece allowing it to be configured as a wall or corner mantel. Includes multi function media cabinet with integrated wire management includes shelf for electronic media components measuring 21.75"W x 8.5"H x 11.5"D. Features Beveled base and panel design with decorative nickel knobs. Both side storage areas measure 12.25"W x 27.25"H x 10.5"D and include 3 way adjustable concealed euro hinges. 2 In 1 DUAL USE MANTEL - Corner Or Wall. Constructed From Solid Hardwoods and Wood Veneers with Hand-Carved Accents &?Multi-Step Finish Process. Electric Fireplace With Energy Saving All LED Technology. Automatic On Screen Indicator Works From Remote Or Manual Controls. Requires No Venting Or Gas Lines. Realistic Resin Logs And Ember Bed. 1350 Watt / 4600 BTUs Forced Air. 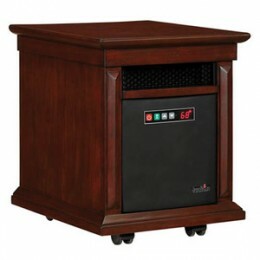 Heater Can Warm A 400 Square Foot Room. Wall configuration depth is 13";Along the wall depth is 32 3/4".